It is getting late. It must be. Around this time of night all the crappy US re-runs come on. But amongst the chaff has come the wheat. 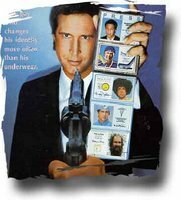 Fletch - that diamond from the 80, the white man's Beverly Hill's Cop, that master of disguise - is bring far too many smile from me for my liking. I even like the theme song. You gem, Harold Faltermeyer. You gem.